SACRAMENTO (CN) – With Congress plotting the destruction of the Affordable Care Act, California lawmakers are railing against the Republicans’ substitute proposal, but killing their own plan for a single-payer system of universal health care. State regulators warned in a report Wednesday that under the Republicans’ Better Care Reconciliation Act, California could face an additional $30 billion in health care costs by 2027 due to Medicaid cuts. “This bill takes a sledgehammer to the improvements we have made in our state’s health care delivery system,” said Jennifer Kent, director of the California Department of Health Care Services. Her department provides subsidized care to 13.5 million Californians. Senator Dianne Feinstein said the Republicans’ latest plan, crafted “in secret by 12 white men,” will give the nation’s richest 1 percent billions in tax cuts. Senate Majority Leader Mitch McConnell, who wanted his bill approved before the Fourth of July recess, has delayed the vote after losing support from the three or more Republican senators which are all the Democrats need to defeat it. Meanwhile, an attempt to ward against Congress’ health care actions and make the Golden State the first with a single-payer system has stalled despite widespread support from the Democratic Party’s liberal base. Assembly Speaker Anthony Rendon announced last Friday that the Assembly would not take up the single-payer proposal in 2017 even after being passed by the state Senate on June 1 in a 23-14 party-line vote. The Los-Angeles area Democrat called the bill “woefully incomplete” and chided the state Senate for clearing the bill without a means for financing the program’s estimated $400 billion annual cost, which is more than double the state budget. Rendon said the bill could be brought up by the Assembly next year but not without major changes. “The Senate can use that time to fill the holes in Senate Bill 562 and pass and send to the Assembly workable legislation that addresses financing, delivery of care and cost control,” Rendon said of his decision to shelve the proposal. The proposal by state Sen. Ricardo Lara, D-Bell Gardens, would overhaul California’s health care system and replace it with a government-run model free of employer contributions and private health insurance companies. The system would provide health insurance to all residents, including undocumented immigrants, without co-pays or deductibles. The reform push is being led by the influential California Nurses Association and has gained the support of Senator Bernie Sanders, I-Vermont, California Insurance Commissioner Dave Jones and the California Teachers Association. Universal health care has become the focus of the Democratic Party’s progressive base. In May, dozens of single-payer supporters interrupted speeches at the California Democratic Party Convention, stirring provocative responses from state party chairman John Burton and others. 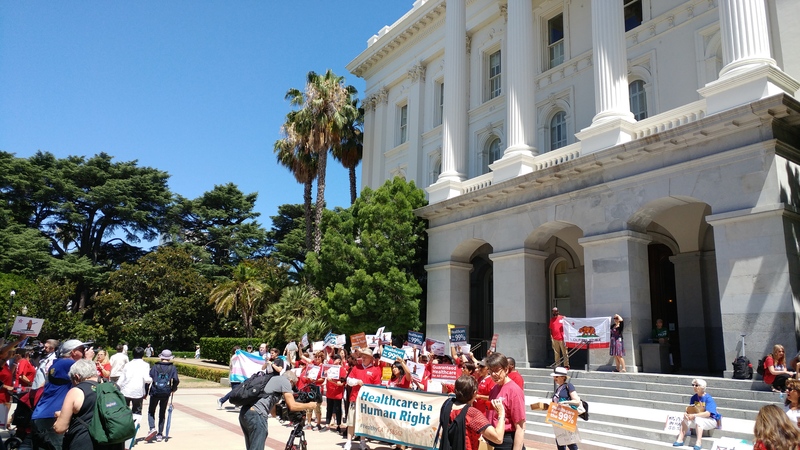 Backers have packed SB 562 legislative hearings and rallied in Capitol hallways. Rendon’s surprise decision to shelve SB 562 garnered a tumultuous response from factions of the state’s majority party. 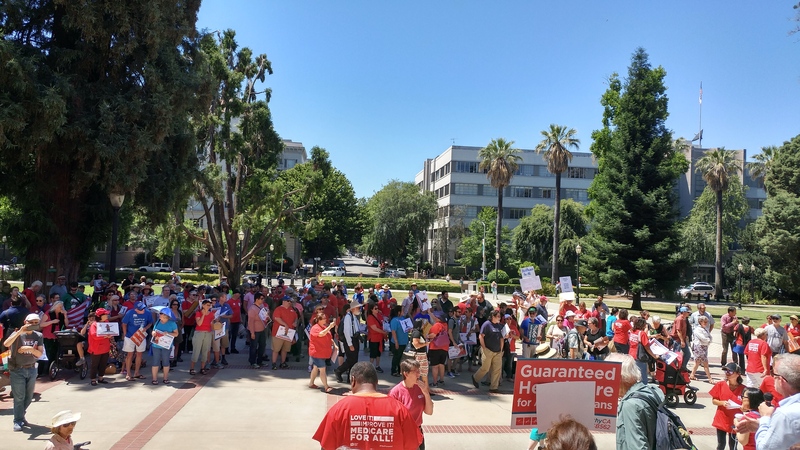 Tensions spilled over on Wednesday as hundreds of protesters gathered outside the state Capitol and marched to Rendon’s office. Protesters called Rendon a “backstabber” and the “insurance industry’s best friend” as they lined the Capitol rotunda. But even if it’s cleared by the Legislature in 2018 and signed by Brown, universal health care in California faces an uphill battle. Aside from a hefty price tag, the program would require lawmakers to maneuver for health care funding due to Proposition 98, which requires that 40 percent of the state budget go to education. The state would also have to apply for federal waivers to get Medicaid funding, and pass major payroll tax increases to pay for the health care reforms. Past attempts at single-payer have stalled in the Golden State; voters rejected an initiative in 1994, and Govs. Gray Davis and Arnold Schwarzenegger vetoed similar single-payer proposals over funding concerns. Amid the renewed single-payer push, Brown says he’s more concerned with what’s going on at the federal level. “Trumpcare 2.0 has the same stench, and effect, as the bill House Republicans and the White House slapped together last month: Millions will lose health care coverage, while millionaires profit. The American people deserve better,” Brown said in a statement.